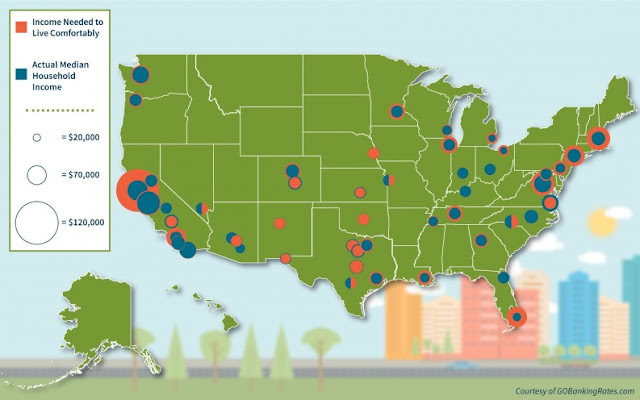 @walfridolopez' blog: How much money you need to live comfortably in the 50 biggest cities? How much money you need to live comfortably in the 50 biggest cities? Unless you're tracking expenses carefully, it can be hard to tell whether your city's cost of living or your own spending habits are the cause of your financial troubles. Using the 50-30-20 budgeting rule, for example ― in which 50 percent of income covers necessities, 30 percent is for discretionary items and 20 percent is saved ― you can quickly determine whether your income is sufficient to cover expenses for living in your city. If it isn't, you might have to cut costs or maybe even move. GOBankingRates conducted a cost-of-living comparison of the 75 most populous U.S. cities, surveying dollar amounts of living expenses including rent, groceries, utilities, transportation and healthcare. This total, which accounts for necessities, was then doubled to find how much money a single person needs to earn in that city to follow a 50-30-20 budget. This study also compares the total amount of income needed to the actual median household income in each city to see if differences in cost of living are matched by differences in pay. Click through to see how much money you'd need to earn to live comfortably in the biggest cities across the U.S. The cities are listed in order of population from smallest to largest.